Receive hints on how to maintain you and your computer's health. Whether you use a computer at work or at home, it is easy to lose track of time. However, health & safety advice recommends that taking frequent breaks can reduce the chance of health problems such as Repetitive Strain Injury (RSI), eye strain, neck and back ache. Healthy Hints will detect your periods of usage and recommend when a break is due. Ensuring that you computer is healthy can have numerous benefits from extending its life span to avoiding the stresses of losing or having stolen your important data. 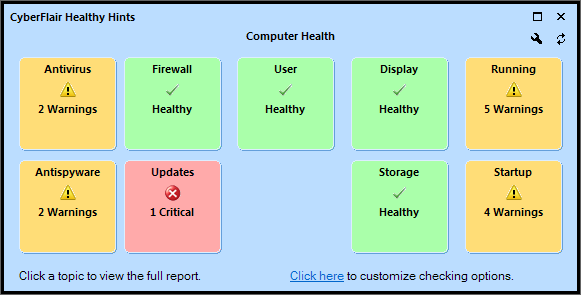 Healthy Hints will monitor various aspects of your computer's health, highlight useful information and give quick access to related Windows tools. FREE edition for personal, non-commercial use. FREE 14-day trial for commercial use. » Click here to view the Software License Agreement. Configuration is simple, just choose your preferred break frequency period, such as having a 5 minute rest period every 55 minutes of work. 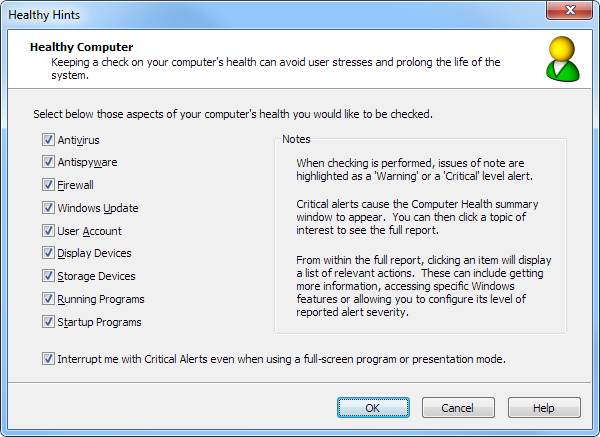 Healthy Hints will then watch your keyboard and mouse activity looking for a period of rest that matches your setting. 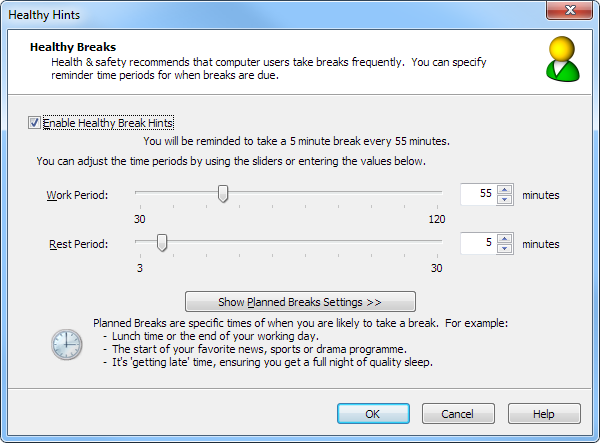 If that period of rest is not detected, periodic reminders for taking a break will appear if you exceed your work period. This reminder will appear every 5 minutes, but offers the ability to suspended or restart your work period. 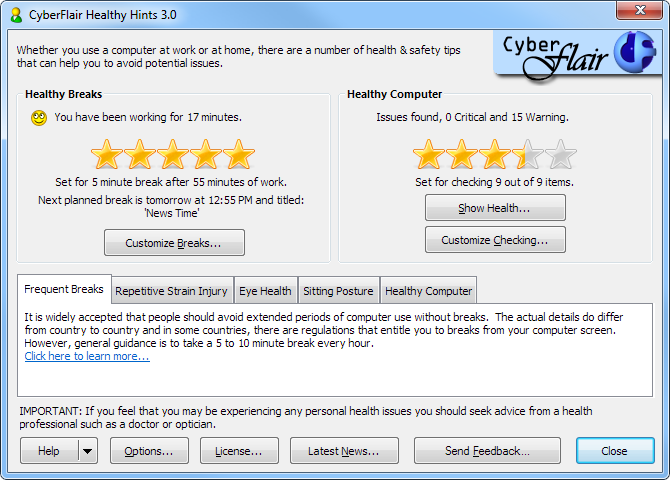 Please note that CyberFlair Healthy Hints is not a productivity tracking tool and does not maintain a history of past work/rest periods for a manager to monitor, as doing so could deter users from taking their Health & Safety breaks. Up to 9 aspects of the computer's health can be automatically monitored. These cover a range of security settings, hardware health and program performance and integrity. Any critical issues founds are brought to your attention, with the option of viewing a full report which will also detail any warnings. From this report, you can select any item to gain access to relevant Windows tools and additional information. Alternative, an item's alert level can be suppressed to prevent further notifications. Customize your recommended work and break durations, with optional for setting planned break times. 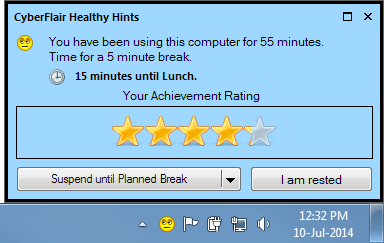 Receive a 5 star achievement rating for keeping to your breaks and maintaining a healthy computer. Add Planned Breaks for times of the day you are likely to take a break, such as lunch or home time. Option to suspend break reminders. Eco Mode option reduces resource requirements which can lead to quicker start-up times, reduced power usage and a longer battery life. Learn more. Digitally Signed product gives better Windows integration and gives you the peace of mind that the software is legitimate and has not been tampered with. Commercial Features such as, Group Policy Administration and organizational branding. Learn more. Supports Windows 8, Windows 7, Vista and XP workstations and Windows 2008 and 2003 servers. Includes additional support for Window Vista and above, for improved integration. If you'd like to know more, you may checkout the online help or why not download and install a free trial. Windows Server 2003 see note 1. Memory 512 MB or higher see note 2. It is recommend that your computer is kept up-to-date with the latest Microsoft® security updates. Minimum is based on Windows® XP. Software requires operating system's minimum requirement for memory. CyberFlair 3D Impressions is a product developed and supplied by CyberFlair Ltd.